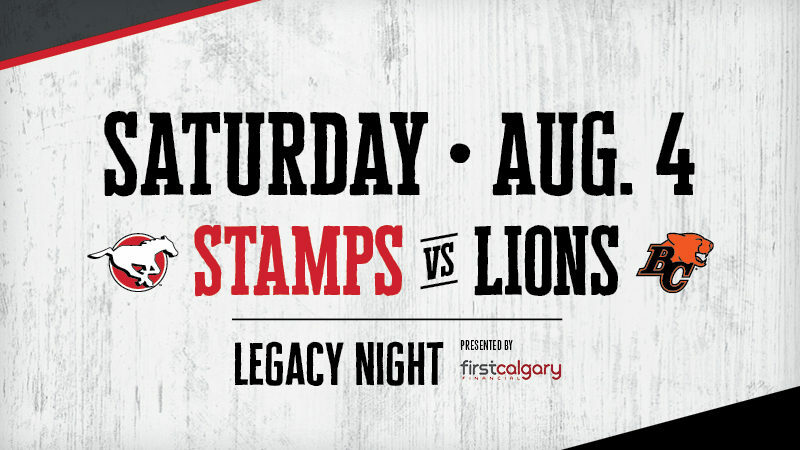 Join us on Saturday, Aug. 4 at 7 p.m. as we celebrate the history of Stampeders football and honor Stampeders alumni at our Legacy Night game, presented by First Calgary Financial. The Stamps will host the BC Lions at McMahon Stadium and fans are encouraged to wear their retro Stamps gear and old-school jerseys for the chance to win great prizes throughout the game! Plus, arrive early for a FREE pre-game tailgate party from 4-7 p.m. at McMahon Stadium’s GridIron Gardens with live music, beer gardens, player autographs and tons of games and giveaways. 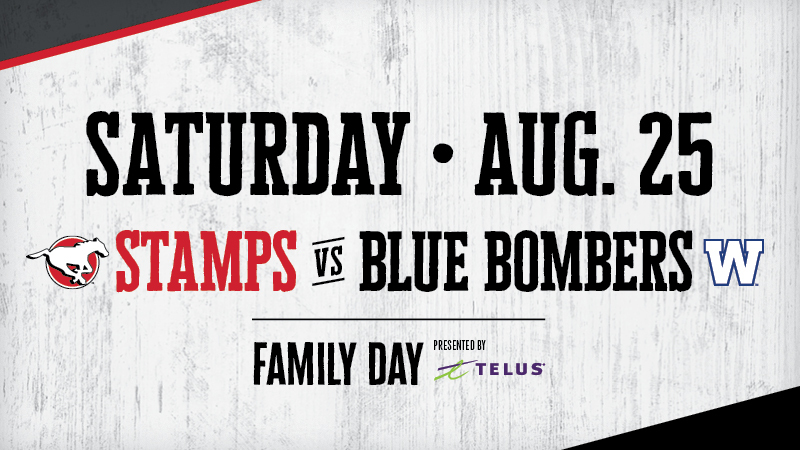 Round up the family and come down to McMahon Stadium on Saturday, Aug. 25 at 1:30 p.m. to watch the Stamps take on the Blue Bombers at our Family Day game, presented by TELUS. Make sure to arrive early for a FREE pre-game family tailgate party starting at 11 a.m. on the South Practice Field at McMahon, where kids of all ages can meet TV characters including Chase & Marshall from Paw Patrol, Michelangelo & Raphael from the Teenage Mutant Ninja Turtles, SpongeBob SquarePants and Dora the Explorer! There will also be interactive inflatables, airbrush tattoos, music, food trucks and more! We will also be honouring the CFL’s Diversity Is Strength program at this game as we embrace the multicultural fabric of our country. Plus, don’t miss the adorable Little Miss Outrider performance at halftime. It’s the most anticipated game of the season – the Labour Day Classic! 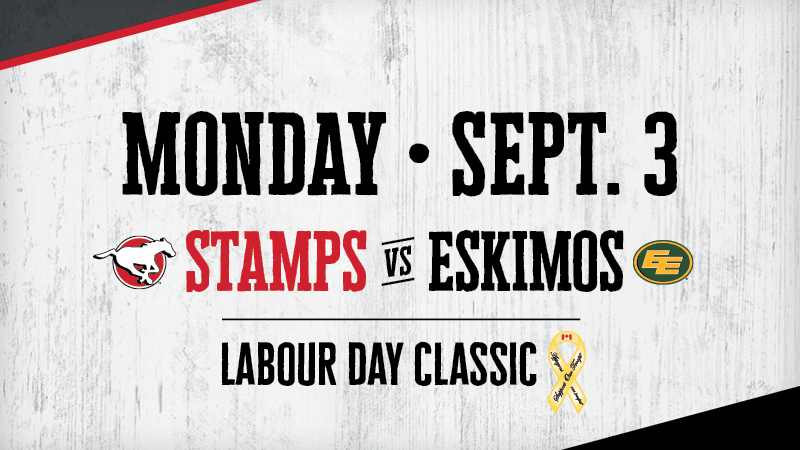 Join us on Monday, Sept. 3 at 1 p.m. as the Stamps host the Eskimos at McMahon Stadium. We will be giving a huge salute to the Canadian Armed Forces and honouring members of the military throughout the game. Plus, make sure to look up in the sky prior to kickoff as the Royal Canadian Air Forces conducts a special flypast! Help pack OUR HOUSE in red and white for this historic annual game. Football, Friday Night Lights and Fireworks…. what more can we say?! 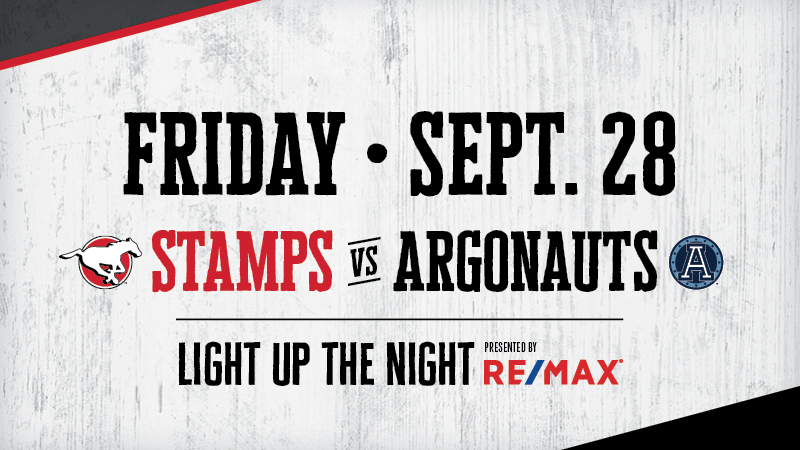 On Friday, Sept. 28 at 7 p.m., come down to McMahon Stadium to cheer on the Stamps as we take on the Argos at our Light Up The Night game, presented by RE/MAX. Make sure to stay in your seats for an incredible fireworks display set to a soundtrack of great tunes! 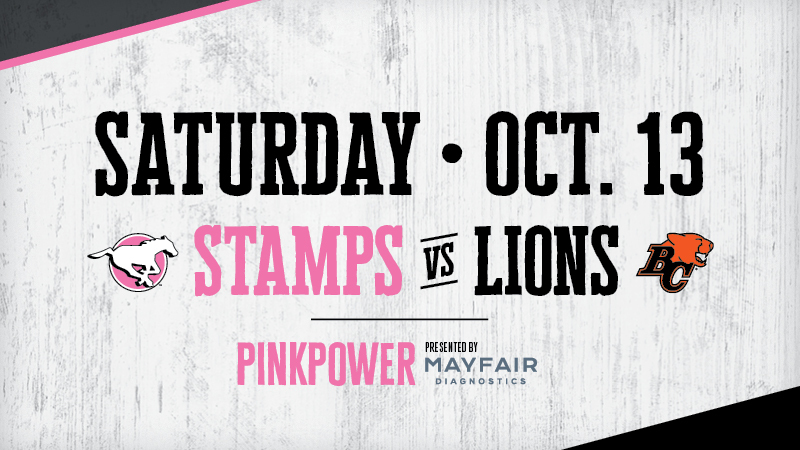 The Stampeders’ dedication to the fight against women’s cancers continues once again this year at our annual PinkPower game presented by Mayfair Diagnostics. Join us on Saturday, Oct. 13 at 6 p.m. when the Stamps take on the BC Lions at McMahon Stadium. As part of the PinkPower initiative, limited–edition pink merchandise will be available for sale at the game for $20 per item with all proceeds going to the Canadian Cancer Society. Get ready to ROCK your RED, Stamps fans! 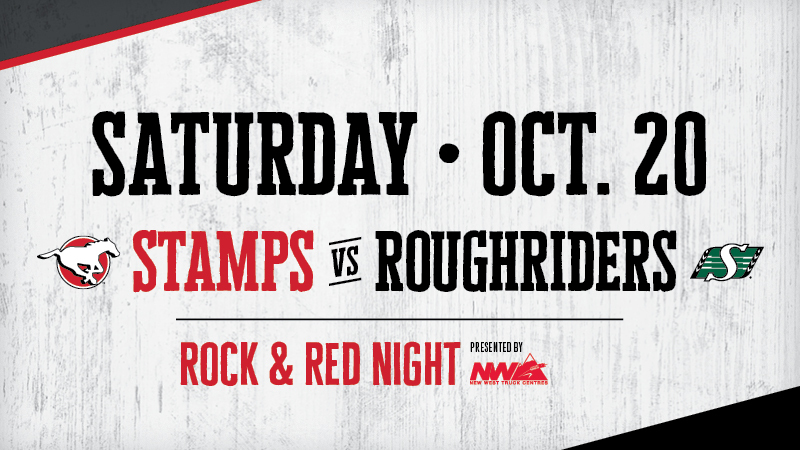 The Stamps host the Riders at McMahon on Saturday, Oct. 20 at 5 p.m. for Rock & Red Night presented by New West Truck Centres. We’ll be playing rock music throughout the game and giving away a Harley-Davidson at halftime! Tonight’s game also marks the signature Jerseys Off Our Backs event as fans in attendance will be chosen at random to win an authentic game-worn Stampeders jersey and meet their selected player on the field after the game. Plus, help us share the warmth this winter! Fans are encouraged to bring new or gently used winter coats to the game in support of The Salvation Army Coat Drive, supported by Q107.